There's an essay circulating the internet about Why to Date a Girl Who Reads (there's a few about why not to date a girl who reads as well). Since I am Girl Who Reads, I thought I should weigh in on the subject. Here are some insights and helpful tip to dating a Girl Who Reads. She might not mind you having a guys' night out or watching the sporting event, because it will give her guilt-free uninterrupted time with the characters of her favorite book. Want a little insight in the inner workings of her mind? Ask her about the universe in which the story she's currently reading is set. Check between the cover of her current read - It'll often give you an idea of her mood - ie. if it's romance then she might be feeling a bit unloved or underappreciated, a police procedural, then she may feel like life is out of control and find comfort in the predictability of the story. Don't get upset if dishes aren't done, house isn't clean, food isn't on the table - sometimes a book is just too good to put down. Want to know the kind of man she wants? Look past the shirtless, tattooed bad boy on the cover and see that the character is tender and caring towards the leading lady. Dating is a complicated maze and I hope I've given you some help if you decide to DATE a Girl Who Reads. I would love to hear your reasons. 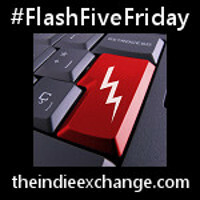 #FlashFiveFriday is a weekly flash fiction/flash blogging prompt. See other DATE posts here. I love this take on DATE, Donna! It's the perfect tie in to your blog. Thanks for sharing! Except maybe you'd like me to do the washing up once in a while! Great post, Donna!